The high price tag of a designer bag isn't always feasible for the average consumer, but a replica bag can incorporate the features you love about the high-end designs, without the cost. Keep in mind that replicas aren't pretending to be designer bags in order to trick consumers; they are merely inspired by them. You can find designer replica handbags at several stores. Some replicas are designed to look so much like the designer bags that they look like the real deal at first glance. Others are loosely based on designer styles but in many cases, more than a quick glance will reveal that they are, in fact, merely inspired by a major fashion house's creation. Choose from styles that are designed to mirror higher-end bags or just try for one that loosely resembles some of the designer options out there that could cost hundreds or thousands of dollars. 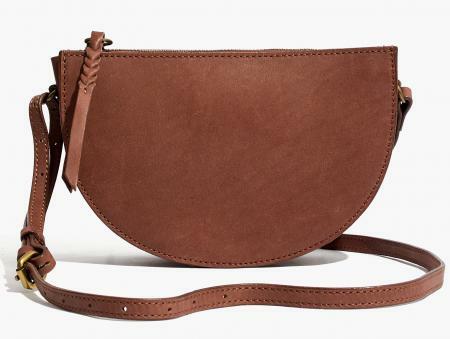 The Juniper Crossbody Bag looks a lot like the Scott Leather Half-Moon Shoulder Bag from Elizabeth and James that has been discontinued. It's made of soft vegetable-tanned vachetta leather. It's available in true black, cider, and rich brown and only costs a little over $100.00. The Chain Crossbody Bag resembles the Tory Burch Kira Leather Crossbody. The hardware is different since the Madewell style can't use the signature Tory Burch logo, and the Madewell bag is also a bit smaller. It is also made of the vegetable-tanned vachetta leather and costs less than $100.00. There are also styles similar to Coach's drawstring bucket shoulder handbag, totes from Michael Kors, and more. You have 30 days to return or exchange a purchase from Madewell. These bags are sold elsewhere, like Nordstrom, and have wonderful reviews. Their bags frequently get four- to- five-star ratings. People love that they can get aesthetics, versatility, and quality for a lot less than designer costs. Signet Bag in Italian Leather (just over $125.00), which comes in five colors and can be monogrammed. It's similar in style (especially with its colorful key fob in a similar shape as a tassel) to the Saint Laurent Monogram Blogger Bag. Where YSL has their logo, you can put your monogram (though the letters will have to be horizontal, not vertical like YSL's). Blogger Petite Impact gave a positive review of the J.Crew bag, saying it held up well to a month's wear and holds the daily essentials with no problem. (It's worth noting that the J.Crew Signet Bag is slightly larger than the Saint Laurent Monogram Blogger Bag). The Madewell Transport Tote (just under $200.00) they carry resembles totes from other brands, like the Burberry Medium Lavenby Reversible Calfskin Leather Tote. The Madewell version is about three inches taller than the Burberry style, and of course not reversible to reveal a Burberry-esque check print, but they're similar at first glance from the outside. It's also similar to the Marc Jacobs The Grind East/West Leather Tote. Other styles resemble bags from Marc Jacobs and Tory Burch, among others. You can purchase items from J.Crew in stores, over the phone, or online. Retail store purchases can be returned or exchanged for up to 30 days, while online and phone orders get a bit longer with 60 days. If you place an order in a J.Crew store to be delivered later, you'll also have 60 days to make your final decision. The Amasie Chain Lock Crossbody Bag (under $40.00) looks quite a bit like the Chanel Boy Bag, down to interlocking circles where the Chanel C's are on the original. The Amasie has some extra shimmer on the flap and it's not genuine leather, but the style is very close at first glance. Other styles and shimmer-free colors are available on the website, as well. You can get this style in large (26 x 18 x 10 cm) or small (23 x 15 x 10 cm), sizes that are close but not exactly the same as the Chanel Boy, according to the chart at Chanel Prices. The V Lady Luxury Leather Clutch (just over $16.00) closely mimics the Saint Laurent Classic Y Cabas Bag, which is no longer available. Instead of a Y, the V bag of course, has a V in the same spot. It is also smaller in size than the Saint Laurent style. Other styles look like those from Gucci, Michael Kors, Kate Spade, and more. 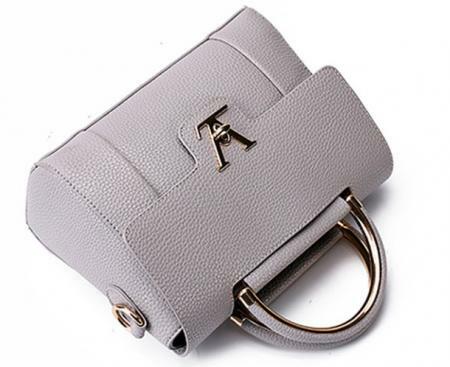 Overall, the reviews of Ali Express handbags are positive, but some reviewers report receiving crumpled products while others say the colors aren't what they expected (reviewers also frequently include pictures with positive and negative reviews, so you'll be able to see more examples before making a decision to purchase an item). Shipping can take weeks depending on where you and the supplier live, and experience can vary by seller. Regardless of the seller, however, you do get buyer protection when you shop through Ali Express. If your item doesn't arrive, you'll get a refund. If the item isn't as it was described, you'll be eligible for a full or partial refund. Do be aware that some bags come with the designer's name on them, but they are not from that designer. Take a look at the comparison between an authentic Michael Kors Jet Set Travel Handbag and a lookalike from Ali Express at EverythingAliEx. Amazon has what seems to be an endless parade of bags, so it's a sure bet that there will be some there that could be considered designer replicas. You aren't likely to find any that are so carefully crafted that they pass for the authentic handbags, sporting the designer name the way bags from some other stores do, but they could have just what you need if you're looking for a loose replica of a bag because you simply like the style of some of the more expensive pieces (rather than the status and superiority the quality designer bags tend to have). 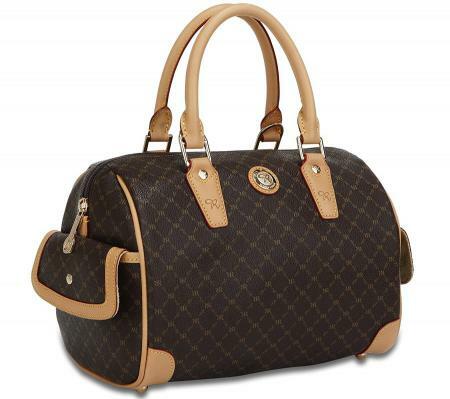 The Rioni Designer Handbags & Luggage Signature Brown Small Boston Bag (around $135.00) is similar to the Louis Vuitton Speedy 30, but simply takes inspiration from the bag rather than trying to create a replica that will trick people into believing it's designer. There's an extra pocket on the side and the print is only similar at first glance. The color scheme and overall look is very similar, however. Like the Speedy, the Rioni bag closes with a gold-tone zipper. The Humble Chic Reversible Vegan Leather Tote Bag (around $60.00 or less) looks a lot like the MICHAEL by Michael Kors Jet Set Totes. The sizing is about the same as the large tote from Michael Kors, though there are different color choices. There are black and brown options in each, but from there, color options vary by season. With 51 reviews, this Humble Chic bag has four out of five stars. Amazon handbags often come with the option of Prime shipping for members, and most items can be returned within 30 days for a full refund. The Women's Mini Camera Crossbody Handbag from A New Day (about $20.00) comes in four different colors and some look more like one designer while others look more like something from another designer. For example, the pink studded version looks a lot like the Valentino Garavani Rockstud Vitello Chain Clutch Bag, while the silver metallic version looks like the Chanel Boy (simply because of the size, flap closure, texture of the material, and chain). The Women's Nubuck Satchel Handbag with Foxford Trim from Merona (about $35.00) looks similar to the MICHAEL by Michael Kors Grayson Satchel, which is no longer available. It's available in Blush, Hearthstone, and Camel with brown trim. There aren't many reviews on the Target website for this bag, but overall, the bag's construction seems to be good while the colors may not appear just as they look on the screen. You can check the stock at your local store right from the website. Most items can be returned up to 90 days after the purchase as long as they're in new condition. 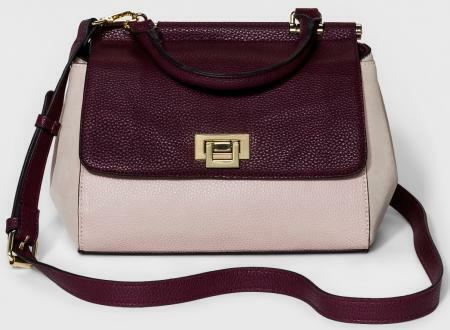 The Women's Top Handle Satchel Handbag from A New Day (about $35.00) seems to have a lot in common with the Coach Drifter Top Handle in Mixed Materials with Edgestain. They have the same curved satchel shape with flap and snakeskin print. The Target color is more of a deep olive while the Coach purse is dark turquoise that veers more toward green than blue. Target fashion selections vary with the seasons, so the bag options and designers they take inspiration from will shift as the year goes on. Target has a generous return policy, giving you up to 90 days to decide whether you want to keep an item (as long as it's still in new condition when you take it back). The care and craftsmanship that goes into a luxury label item are much higher than the average department store purse. But what makes the designer purses so outstanding? The most prohibitive handbags are frequently cut from expensive materials such as genuine python, alligator, crocodile, or the softest calfskin leather imaginable, but it's not just the type of material that makes them so special. Many times a handbag is cut from a single piece of alligator or crocodile skin so that the design of the bag is fluid and congruous. Finding such specific materials is a costly and time-consuming process. Add features like 18 karat gold hardware, with an inner Japanese silk lining, and you have created a very ornate handbag. Some designer handbags are so limited in their production that only a dozen or so are created each year. The Hermes Birkin bag will often boast a wait list of three years. These limited edition pieces are only made more enviable to consumers due to their narrow availability. Most people can probably appreciate the effort that goes into making a designer bag. However, many consumers simply cannot afford or choose not to pay such prices in order to obtain the status of a designer handbag. This is where replica manufacturers come in. A manufacturer may study the design of an upscale handbag carefully and memorize the style nuances. Some manufacturers attempt to create a likeness that can be sold for a much lower price (though sometimes still several hundred dollars) but is indistinguishable from the original to the average consumer. This is considered a fake or counterfeit handbag and is illegal. These counterfeit products will also bear a brand name or logo of designers such as Gucci, Chanel, Louis Vuitton and even mid-level handbag designers such as Coach and Kate Spade. There are some fake bags on the market that are advertised as "replicas" that are actually counterfeit. They're using the designers' names and signature patterns (like the Burberry check pattern or interlocking Gucci Gs) and though they aren't directly advertising that they're authentic to consumers, the bags can be represented to others that way once a purchase has been made. They are impressive copies that get all the details right and could be tempting to buy, but they're illegal. Inspired-by replicas have a slightly different graphic, pattern, or design than the original. Colors and accent details may also differ from the inspiring design. On a designer-inspired purse, the logo will be altered from that of the designer so as not to violate copyright law. If it is a 'fake,' the logo will not be noticeably altered and will attempt to be as close to possible to the real logo to fool consumers. It is a frequent occurrence when online shoppers spot a Chanel bag on an Internet auction that is several hundred dollars less than the average genuine Chanel bag. Believing themselves to have found the deal of the lifetime, they will purchase a retail-priced $1700 Chanel bag for only $150 online, unaware that they have bought a fake handbag. If you come across a deal on a designer bag that seems too good to be true, it probably is. Other manufacturers create handbags that are influenced by upscale designer bags and sell them at a much lower cost to consumers. These bags might be called replicas, knock-offs, or designer-inspired styles. These bags will not claim to be the original brand or bear the logo of the brand. There are many terms used for handbags that simulate designer styles. Knock-offs or designer-inspired bags: When a bag is designated as an inspired-by or knock-off style, it indicates that the bag is not authentic and the seller is not attempting to sell it as an authentic bag. Replicas: These are also sometimes called fakes, copies, or mirror images, however. The term 'fake' is typically reserved for when sellers attempt to deceive others into thinking the bag is an authentic designer purse when it is not. Fake or counterfeit: They look just like designer bags, down to the logo and signature fabrics. Sometimes a store will call these replicas so they aren't misleading the consumer. Selling fakes is illegal no matter what; selling designer-inspired handbags is not. Replica purses are not produced according to the quality standards of the original luxury designer items. The craftsmanship will not be as precise and flawless as a designer purse. While designer bags use high-quality leather, fabric and hardware, replicated bags typically use lower quality fabrics, faux leather and plated or plastic hardware. A high-end designer handbag, when cared for properly, can last decades. The average fake cannot boast an endurance level that is even close. Persons looking to purchase replica handbags should understand that the luxury of an item is not in its label, but in its craftsmanship. People familiar with upscale luxury products will immediately notice a difference in the stitching and detail of a fake handbag when compared to their genuine counterparts. The manufacturing of handbags that use the logo or exact style or design of a designer handbag is illegal. The production and sale of fake handbags cost American taxpayers millions of dollars annually. Such products are often created overseas under unsafe working conditions and then sold to consumers who possess little understanding of the ramifications of the counterfeit industry. Though counterfeit replica products lurk mostly on Internet auction sites, companies such as eBay are currently making a more pronounced effort to discourage counterfeit merchandise from being sold. If you don't have the money for an authentic Hermes bag, and can't find a knock-off you love, you do have alternatives to purchasing a replica. Consider some of the following ideas. 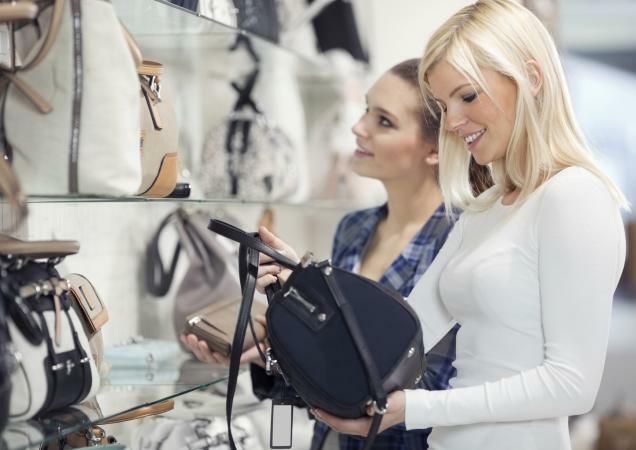 Consider mid-priced designer handbag lines. Many department stores carry designer bags at a range of price points; consider a more classic style from a lower-priced designer if you can't afford the latest 'it' bag. Check out handbags from emerging designers. These designer bags may be lower in cost because the designer is less well-known, but are high on style and quality. Rent the original. Handbag rental companies like Bag Borrow or Steal allow you to rent and even purchase gently used designer bags. Go custom. Many smaller handbag artisans are happy to create a custom bag for you, and you'll have an authentic bag designed just for you at the fraction of a cost. Downsize your bag, not your style. If there is a name you really love in handbags, consider one of their smaller bags. A small flap bag, hobo, or clutch can pack just as much style for a smaller price tag. Many retailers produce reasonable quality goods that aren't necessarily as luxurious as a Prada product, but the designs can be similarly attractive. Counterfeit handbags are never elegant. It is preferable to possess a well-made genuine design, even if your handbag comes from a lower-end label, than to be caught carrying a forgery.